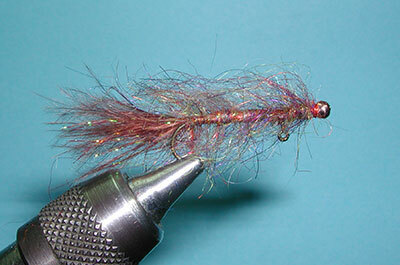 Bead: Gold Conehead on straight brad lashed to hook. 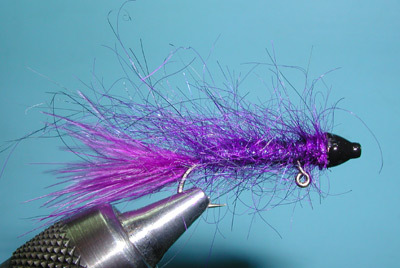 Black 3/0 Monocord to lash the brad or pin to the hook shank. 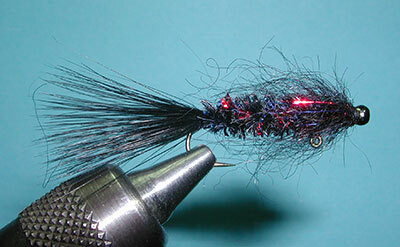 Notes: The Balanced Leech came from the efforts of Jerry McBride of Spokane, Washington around 2005. 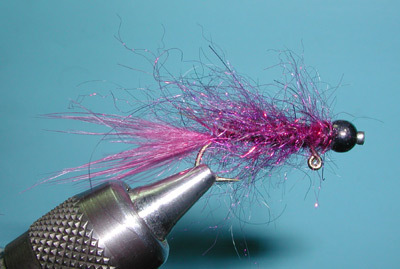 Jerry looked for a way to suspend the hook in a horizontal position and was inspired by a discussion of lashing beadheads to hooks with pins in Leeson and Schollmeyer's Fly Tier's Benchside Reference (page 431). The Benchside discussion had bent the pin so that the bead was positioned above the shank and would turn the hook upside-down. Jerry kept the pin straight and extended beyond the eye of the hook so that the hook would not only ride upside down but also be balanced within a horizontal position. Pins worked great on small beadheads and hooks smaller than size 10. Larger patterns, particularly those using coneheads, require a larger and heavier brad to suit the purpose. 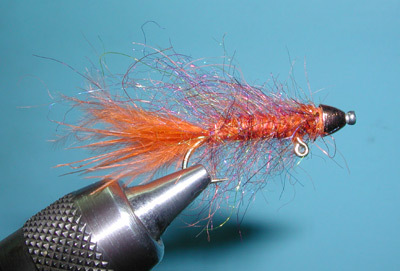 Jerry applied the "Balanced" concept to a number of stillwater beadhead patterns. 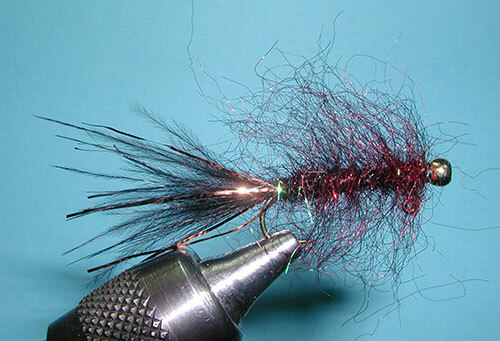 The Mohair Leech pattern using Arizona Simi Seal became quite popular around 2005 with the many different colorations that John Rohmer developed. The materials have such a strong following that the pattern developed it's own name, the Simi Seal Leech. 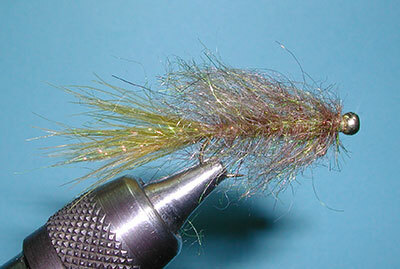 In addition, jig style hooks with either a 60 degree or 90 degree eye were starting to be utilized within the fly fishing community. Together, these hooks and materials work well to provide a larger Balanced Leech in sizes 4-10 for trophy lakes such as Crowley, Davis, and Pyramid. 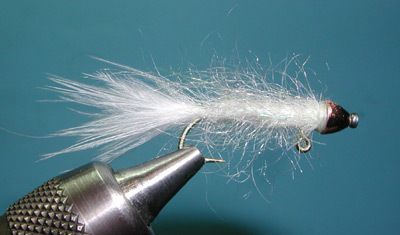 Sparkle Chenille, Angora Goat, along with some flash material such as Wing N' Flash will also provide excellent bodies for the Balanced Leech. One popular pattern at Lake Pyramid is the Midnight Cowboy. Often you will find this tied with a Sparkle Chenille (Midnight Fire) having bits of Blue and Red mylar within the chenille. However, the pattern can also be tied with Black/Blue and Black/Red Simi Seal.